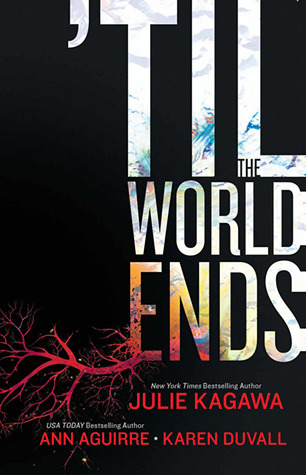 Thistle & Thorne is the second story in the ‘Til The World Ends anthology. I am reviewing all three novellas separately and you can read my review of Julie Kagawa’s Dawn of Eden here. I haven’t read anything by the author before, but I really enjoyed this short novella and I think I’ll look into her Razorland series after all, even though I wasn’t all that intrigued with it before! From what I’ve heard, Thistle & Thorne precedes the events in Enclave but features different characters. EDIT: Ann Aguirre contacted me and cleared up that the world in this story is not related to the Razorland series. I'm sorry about the confusion - I read in someone else's review that it was a prequel and simply believed that because I didn't know any better at the time. Thistle & Thorne is set in a post-apocalyptic world where a sharp division is made between rich and poor. Those who are either rich enough to buy their way in (or born privileged) live in gated communities called fortresses. Their lives are full of luxury and they have enough food, clean air, actual trees etc. The less lucky ones have to try and survive in the Red Zone among crumbling buildings, backstabbing, and crime. It took me moment to get a hang of the world building but I soon found myself at home and figuring out the rules of the place. The world our heroine Mari lives in is harsh and gritty and I felt the way it was developed in the story very realistic. Mari herself is a strong woman trying to survive in a world that is primarily shaped by powerful men. She has two younger siblings whom she is taking care of as best she can, working as a thief-for-hire to pay her way through life and to protect her brother and sister from the dangers of their surroundings. For them, she would do anything and despite her grim prospects she never gives up. When a theft she was contracted to commit goes badly, Mari has to team up with Thorne Goodman to escape the wrath of Stavros, a crime boss threatening her block with annihilation. Together, they form a plot to overthrow Stavros’ reign. Thorne himself and his motivations are shady at first, but I really enjoyed seeing his character gain depth and grew to like him a lot. He and Mari made a killer team! Each of them could stand on their own but working together they were so much better. There was a bit of romance, too, but it never hijacked the story. There is also a cast of side-characters that rounded the story off well and showed more sides of the world Mari moves in. I loved her neighbor, Nat! That woman can make you soup and take care of your siblings just as well as craft you a knife. The writing flowed very well and the pace built up more and more towards the resolution and final showdown. I would have read the whole story in one setting if real life had not interfered. Even though the setting is bleak, there were also descriptive passages I found very beautiful and that showed Mari’s ability to find hope among the darkness and imagine a different, better future. The ending wasn’t a huge surprise but it also wasn’t guaranteed from the beginning and there were a few twists. Overall I really enjoyed Thistle & Thorne and actually wished it was a bit longer! I’d love to see what happens next, but as far as I know these exact characters don’t make an appearance in the Razorland series. I think there’s a loophole kept open for another story though. I can hope, can’t I? I’d be up for another team-up between Mari and Thorne anytime. I’d recommend the story to anyone who enjoys post-apocalyptic books or stories about organized crime featuring a strong heroine and layered hero. Small warning: there is quite a bit of graphic violence, hence why the story falls into the Adult category. I hope I'll be able to read your review on Sunday! I'll be in Spain, but the hotel should have free WiFi, I believe. I feel like I need to clarify: this is a completely different apocalypse. It's not related to the Razorland world in any fashion. And provided I get time, I'd love to give Mari and Thorne a book. Thank you for clearing that up! I checked what your different serieses are about on Goodreads and thought it was unrelated, but then I read in someone else's review that there is a connection, and since I hadn't read the Razorland books I simply believed that person. I'll put an note into the review in a second. I really enjoyed Thistle & Thorne and hope you will get the chance to write a full-length novel :) Thanks so much for stopping by and commenting! I haven't heard of this series :) But it sounds awesome though! I guess I should heck out book one! I haven't read any of Razorland either, or by author. But Mari and Thorne sound great and glad you enjoyed your time with them. That is usually why I don't read short stories--I want MORE.